I love creating handmade cards and trying out new paperctafting techniques. My favorite thing about cardmaking is that I get to spend time and craft with my amazing, twin daughters. I am married to my wonderful husband, Rich, for nearly 13 years and we have beautiful and smart twin 12 year old daughters, Victoria & Olivia (aka crafters-in-training). We also have one crazy dog named Amber. I have been working for EY for 30+ years (I started at age 7 ;-) ) and I manage a team of Program/Project Managers and Business Analysts for our internal IT Organization. I have been crafting since I was in my twenties - I have done so many things over the years including crocheting, making wreaths and floral arrangements, and scrapbooking. If I had to choose, I would say my true passion is papercrafting. 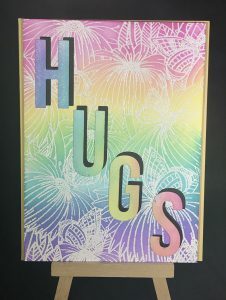 We, my daughters and I, mainly make cards for any and every occasion, but we also make lots of other fun paper crafts too. Thanks for joining me on this journey and feel free to reach out to me if you have questions!! Happy Crafting! !